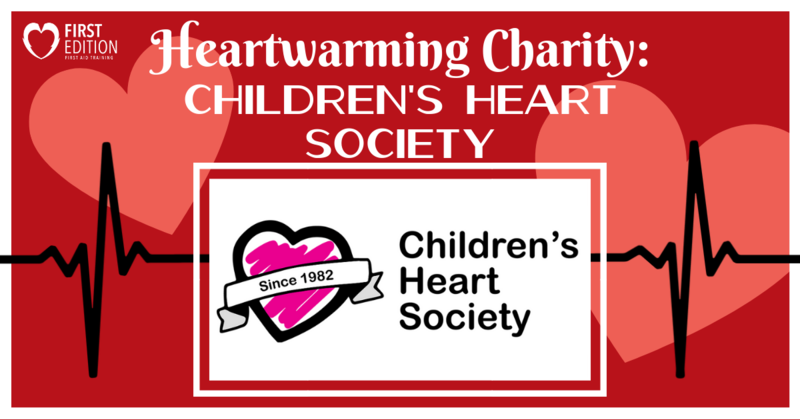 Heartwarming Charity – Children’s Heart Society - First Edition First Aid Training Inc.
Heart disease affects people of every age, even children. Many children across the globe are born with congenital heart disease or acquire it early in their lifetime. Families with children who suffer from heart disease often require additional emotional and financial support throughout the process of doctor appointments and even potential surgeries. It is organizations like the Children’s Heart Society in Edmonton, Alberta that are focused on helping these children and their families! Take a look at our heartwarming charity of the month, the Children’s Heart Society, and see what they are doing to make a difference in the lives of hundreds of children living with heart disease! As the organization was founded by mothers who understood what it was like to need support with a child who has heart disease, the organization works to provide that exact support to those in need. The Children’s Heart Society offers a variety of programs to help families through these tough moments. The charity offers in-hospital support that includes comfort bags for the parents containing information for parents and special items for the child going for heart surgery. The goal is to bring fun to the hospital and visually show the family support by having others there to love on them. The organization also provides mom nights and dad nights to allow parents to connect with others going through similar experiences. Finally, the organization offers family events that focuses on bringing the family together for fun days and provides opportunities to bond with their child and other people. The Children’s Heart Society collects donations and has fundraising opportunities to “support children with heart disease and their families by providing support, education, research and awareness.” The organization is also known to have donated to other important charities such as Kids Up Front, the Ronald McDonald House, the Dr. Coe Research Fund, and others. Want to get involved further? Contact the Children’s Heart Society for more information! If children living with heart disease can be helped through surgery, support, or advancements in research, we can create a better future for all by assisting them. The more hearts that can be helped, the better chances that these children will live long and happy lives! It is charities like the Children’s Heart Society that is truly making a difference for the parents, friends, and family of those linked to a child living with heart disease. It all comes back to the heart, and that is why we support the Children’s Heart Society for everything they do to improve the lives and mental health of those in need!